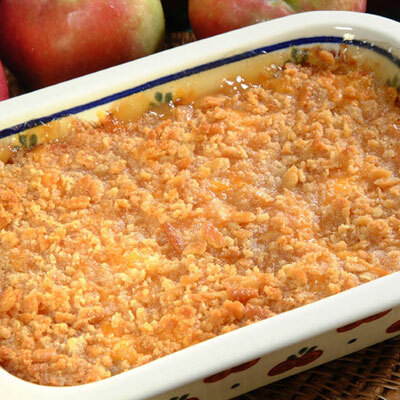 This wonderful casserole pairs cheddar cheese and apples. A bit of hoop cheese has been added to provide a creamier texture. Simmer apples in boiling water until just tender. Drain and layer half of the apples in a buttered 2-quart casserole. Combine remaining ingredients and sprinkle over apples. Repeat layering with the other half of the apples and remaining sugar, cheese, and cracker mixture. Bake at 350 degrees for 30-45 minutes or until golden brown and bubbly. Let rest for 10 minutes and serve.